So, to be completely honest, I’m panicking a bit right now. Because tomorrow morning, I’m going to open our home up to some amazing mom friends for our first official Moms Group of the year. I started the group last year, with the goal of having a group where moms could share and connect and encourage each other. It was beautiful and awesome and everything I hoped it would be. So this year, we’re meeting up again. Tomorrow. 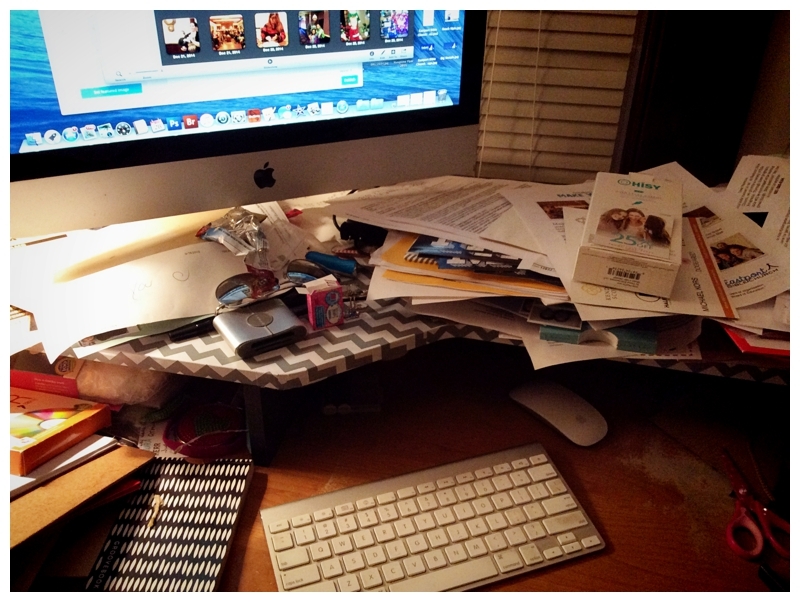 The only problem is, is that this is what my desk looks like. And there are a few piles of laundry on our couch, waiting to be put away. And my kitchen and dining room both need to be decluttered and swept. And Jeremy will be home from Basketball in about ten minutes and then I’ll need to cook us both dinner. Because we happen to eat super late on basketball nights. So I’m panicking a bit. And writing. Because it helps in a little sort of way. And it’s funny. Because tomorrow, amazing moms will come to my home. And I really doubt very much that they will care what it looks like. I think they’ll mostly care about getting together with other moms. Sharing hearts. Possibly they will care about eating the delicious bagels that I’ll pick up from Pete’s in morning (I know I will because they are my favorites). They’ll care about taking an hour for themselves. To regroup with a group. To be refreshed and encouraged. And that is what really matters. And I write this all to encourage us as women, us as moms. Because if you’re like me, at times you’re tempted to hold back and not let others in. For fear of what they might think about your messy desk. Or because you’re a way better cleaner than I am, but maybe too distracted about getting things done instead of getting real and important connections with others. But I think, that more important than the messes or the clean is the connection. The time that we take with and for others. So there you have it. I’ll still finish writing and then go and attempt to clean things up a bit. But I’ll know that the most important thing, will be getting together with moms, from 9:30am-10:30am at our home to share lives and share encouragement. *If you’re local, come and join us! It’s an open group, for moms to connect and we would love to have you there.